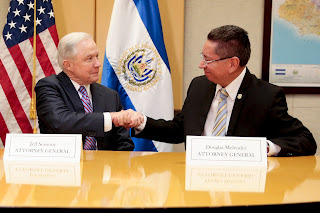 During their meeting in San Salvador this morning, Attorney General Jeff Sessions congratulated Attorney General Douglas Menéndez on their announcement that Salvadoran prosecutors today charged 113 MS-13 gang members in El Salvador. In addition, 593 gang members were charged yesterday, including many MS-13 members. Attorney General Jeff Sessions is traveling to El Salvador to meet with law enforcement officials and discuss efforts to combat the MS-13 gang. As NPR's Carrie Johnson notes, "the attorney general's travel puts some distance between himself and the toxic environment in Washington." Sessions has been brutally and repeatedly criticized by President Trump over the past few days, with the president openly questioning whether Sessions will stay in his post. Forging ahead with the tough-on-crime agenda that once endeared him to Trump, Sessions plans to meet his Salvadoran counterpart, Attorney General Douglas Melendez, before convening with other law enforcement officials on what his program calls a transnational anti-gang task force. He will tour a detention center and meet former members of MS-13, also known as Mara Salvatrucha, which Sessions has called a top threat to public safety in the U.S. In addition to meeting with Douglas Melendez, his counterpart in El Salvador, Sessions also met with president Salvador Sanchez Ceren, and with the director of the National Civilian Police, Howard Cotto. But Sessions' statement also distorts the truth. Once again, there is no information that allows the attorney general or Trump's administration to affirm that these murders are attributable to the arrival of undocumented minors, who began coming to the United States in larger numbers in 2014. In fact, there is no study by federal agencies or academic institutions that proves that there is a significant number of gang members among these minors. On the contrary, a large portion of these undocumented youths who come seeking asylum claim that they are fleeing gangs in the Northern Triangle.